Sister Val Cervetto has served Mercy Community in many and varied ways, as a Sister of Mercy and since 1993 as an official volunteer. Sister Val is 92 years old and is an outstanding example of what it means to serve from your heart. Sister Val’s exceptional contribution is to the residents, families and staff of our aged care facility at Nudgee – and the wider community and parish who benefit from her daily acts of service. Every day, Sister Val pours her boundless energy and enthusiasm into setting up the Chapel and Sacristy at Emmaus, to make sure that it is in impeccable order for our priests and people attending services. Sister Val ensures that the Chapel is immaculately ready for the liturgies and masses that are so important and meaningful for our residents – including the Anglican masses that are run monthly for residents of that faith – with her care and attention to detail reflecting her own deep spirituality and commitment to her faith. Sister Val personally looks after the laundering of all of the priests’ vestments, making sure that they are freshly washed and delivered back to the sacristy. She attends to all the flower arrangements, ensuring they are fresh, carefully placed and that older flowers are removed. Sister Val orders all supplies such as bread and wine for communion, and nobody can ever recall supplies being delayed or late. She makes sure that every little detail is taken care of and is a major reason for our masses and liturgies running so smoothly and being such serene, meaningful events that are of profound significance to our residents. Sister Val is present at every special event to ensure every detail is taken care of: All Soul’s Day, St Mary Mackillop Day, Mercy Day, and the individual celebration days of such special meaning to the Sisters of Mercy. The mission to love, care and serve others drives this very special woman every day to work in our Chapel, for the benefit of God and others. Sister Val attended the Kangaroo Point Catholic School for her primary education and later went on to All Hallows. In 1957 she went to PNG as a music teacher but as was the way in PNG, often the “jack of all trades”. She also taught in many rural and city schools during her vocation as a Sister of Mercy. 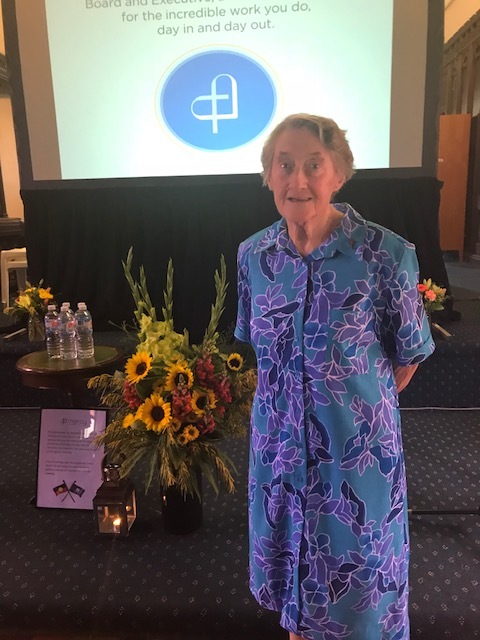 In 1991 she served the people of Melbourne, in 1992 the people of Wynnum in Brisbane and in 1993 she came to Nudgee, Aged Care and was involved in Pastoral Care and the care of the Chapel.